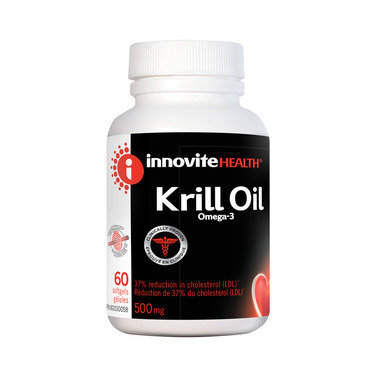 Innovite Health Krill Oil Omega-3 contains 100% pure Neptune Krill Oil NKO® which has clinically demonstrated the ability to protect the heart, act as an anti-inflammatory, and significantly lower LDL ("bad") cholesterol while raising HDL ("good") cholesterol. Directions of Use: (Adults): Take 2 softgels per day with a meal. To help reduce serum triglycerides or relieve symptoms of dysmenorrhea and premenstrual syndrome, take 4 softgels per day. Non-Medicinal Ingredients: Gelatin, glycerine, purified water, sorbitol, ethyl vanillin. Free From: wheat, gluten, nuts, peanuts, dairy, soy, eggs, yeast, sugar, starch, GMO, artificial flavours, colours or preservatives. Caution: People who have a problem with coagulopathy or taking anticoagulants or other medications should consult their doctor before taking this dietary supplement. Consult a health care practitioner prior to use if you are pregnant or breastfeeding. Do not take if allergic to seafood (fish, crustaceans, molluscs and other seafood). Allergy Information: Contains seafood and fish protein.